Patients can choose between composite and amalgam fillings. Fillings are done to remove decay and replace the affected tooth structure. It is called a filling because a new material fills the hole left by decay. These days, most teeth are treated with bonded tooth-colored composite resin fillings. When cavities are diagnosed early, they can be treated easily and painlessly. If not treated, decay can lead to tooth pain and/or infection, and the tooth would need root canal treatment or extraction. An amalgam (Silver) filling is used to repair a tooth that is affected by decay. The decayed or affected portion of the tooth will be removed and the new amalgam restoration placed. There are many types of filling materials available, each with their own advantages and disadvantages. You and your dentist can discuss the best options for restoring your teeth. 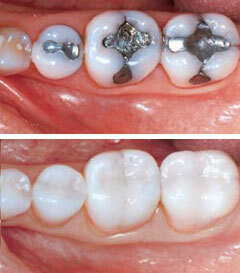 Amalgam fillings were at one time the most widely used restorative materials. Because composite fillings are tooth colored allowing for higher esthetics and strengthen the teeth in which they are placed, we utilize more composites in modern dentistry. Amalgams are still used in certain situations in which esthetics and strength are not as high of a priority. They are also a less expensive alternative compared to composite restorations.